It’s a Facebook Launch Party & You’re Invited!! It’s Party Time! Yep, Pure Romance is launching another party with lots of amazing prizes. I hope you’ll join us to chat with your favorite authors and meet some new ones. So sit back, get your coffee or glass of wine in hand and visit our party page at: https://www.facebook.com/events/1629544227286178/ Click on ‘going’ and by all means invite your friends to do the same thing. NOTE: If you can’t get through–FB is evidently not allowing this page to go through– give Karen Docter a shout at https://www.facebook.com/karen.docter. She’ll invite you personally. The party begins June 17th with Nerdy Girl hosting a three-hour Bonanza beginning at 7:00 pm until 10:00PM, THEN on June 18th and 19th the whole gang with lots of guest authors will be chatting from 10:00AM to 10:00PM. Hi! 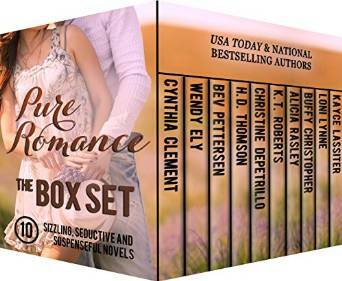 I’m going to be participating in a Facebook launch party for the new Pure Romance Boxed Set. I will be guest-hosting at 3:30 PM (Denver/Mtn) on Thursday, June 18th, and I hope you can join us! I’ll be talking about my new release, COP ON HER DOORSTEP, sharing more about the stories and characters, and answering questions. I’d love to have friends and readers participate. ONLY $ .99 ~ PRE-ORDER YOUR COPY TODAY!!! Even if you can’t attend, please click that link to “join” the page and let us know you like to read romance! Pure Romance Launch Party! June 18-19, all day!